My name is Dr. Jenny Main, and I’d like to introduce myself to you! I grew up in Cedar Falls, Iowa. I obtained a Bachelors of Science in Psychology from the University of Iowa. I graduated from the University of Iowa College of Dentistry in 2006. I have enjoyed practing dentistry over the past 10 years in both private practice and in public health care settings. I am a member of the American Dental Association and the Iowa Dental Association. I am also on the University of Iowa College of Dentistry Alumni Board. I have been a “key contact” between the Iowa Dental Association and a member of the Iowa House of Representatives. Most recently, I have become a member of the Spear Study Club here in Des Moines. My husband, Dr. Michael Main, and I have three awesome little children. I love my family, and as a patient in this office, you will learn a lot about them as I talk about them often! Family is very important to me, and it is always my goal to treat you, the patient, like family. I will strive to help make you feel comfortable and satisfied with each visit you have at this office! And we hope that in time, you feel like you are part of our family! When I am not practicing dentistry, I enjoy spending time with my family, traveling, and cheering on the Iowa Hawkeyes. 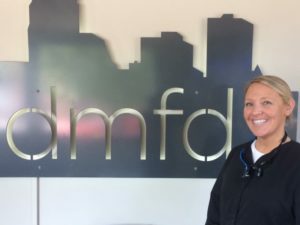 I am looking forward to learning more about you at your next visit to our office, Des Moines Family Dentistry!